Determines if fish are suitable for human consumption: Monitoring toxic contaminants in fish tissues helps reduce risk of negative impacts to human health from fish consumption. Informs if and where public health advisories are needed: An expanded monitoring program would help target specific areas for issuance of health advisories. Tracks trends in concentrations of mercury in fish tissues over time: The ability to follow trends in mercury concentrations in fish can help managers understand more about the process of how mercury accumulates in fish tissue. Rhode Island has ample access to rivers and oceans, and residents treasure fishing as a popular recreational activity. Most Rhode Islanders are a short drive, an accurate cast, and some patience from fresh fish. Fishing is enjoyed by people from a range of socioeconomic backgrounds with preferences in species and recipes sometimes linked to ethnic and racial heritage; regardless fishing provides both dinner for the table and relaxation by the water. It is no surprise that people in the Northeast US eat more fish than any other region in the country. Photo courtesy of Watershed Counts. There is a growing awareness, however, that fish consumption can be a double-edged sword. Fish is an excellent source of protein, can reduce the risk of cardiovascular disease, and promotes cognitive development in children. But, those same fish may also contain mercury that negatively impacts cognitive development. So, the amount of fish that is safe to eat becomes a balancing act—particularly for pregnant women and young children—to minimize mercury exposure and maximize health benefits. 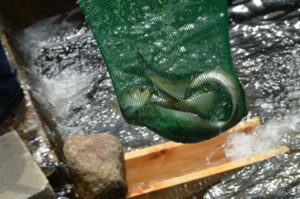 One possible solution is to emphasize consumption of fish that are low in mercury. Some fish, such as salmon and pollock, show lower mercury levels than other fish, such as tuna and striped bass. This does not mean that these fish with higher levels of mercury cannot be eaten, especially by non-pregnant women, but it is important to be mindful of how much of each species is being consumed while making informed choices depending on the specific circumstances of the individual. Additionally, specific water bodies may have fish with higher or lower than average mercury levels. Currently, there is not enough information available about mercury levels in various fish species in different Rhode Island waters, which limits effective recommendations about fish consumption. Instead, current advisories are based on national studies and limited local data. Expanding testing of mercury contamination in fish monitoring programs would allow identification of those waters and species for which fish contamination presents a health and safety risk, allowing Rhode Island to better inform the public of such dangers through fish consumption advisories. Nicole E. Rohr, PhD, The Coastal Institute, 220 S. Ferry Road, Room 124, Narragansett, RI 02882. 401-874-4866. nrohr@uri.edu.